Sometimes you just don’t want a girly space. Try industrial decor if you feel that you need to prune your possessions down to the bare minimum, and you need a space that your man can live with. This style is a minimalist style - it is simple and uncluttered. There is no need to over-furnish here. 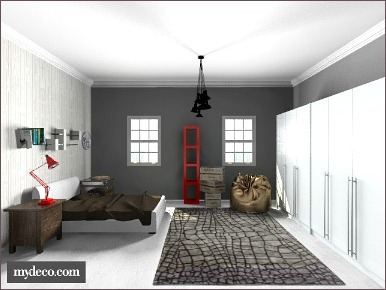 With this style of decorating, you are trying to create a warehouse feel - no frills and no fuss. I know that living in a warehouse doesn’t sound all that appealing, which is why there is no need to take this all the way and go too over-the-top. This is essentially a modern look, so combine modern furniture with this raw background. Sometimes it can be fun to throw in an unexpected twist - like some feminine furniture or fabrics against the masculine hardness of the room. With minimalist decor less is more. Don’t accessorise where you don’t need to, and keep the space functional. 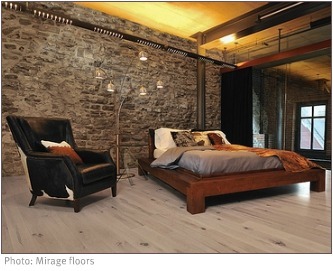 Now lets give this standard blank slate bedroom (below) an industrial decor makeover. This is the kind of bedroom you find in many newly built townhouses, consisting of a light carpet and built-in melamine cupboards. 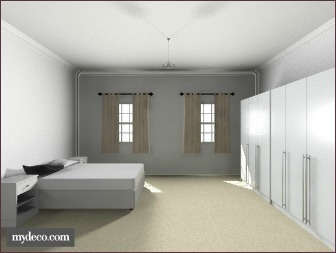 •	Firstly to make the space more masculine, I removed the carpet. In an older house you may find wooden floors in need of attention under a carpet, but in a new townhouse there will definitely be cement. The cement floor can be refinished and sealed, or painted with an epoxy floor paint. •	The colours were kept neutral. The most important would be grey as it is very versatile. A feature wall was created behind the bed using wallpaper with silver and grey lines. 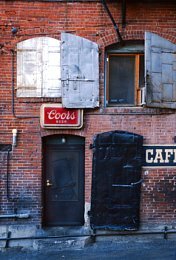 •	Accents of colour were added here and there to keep the place from looking too drab - I decided on red. •	This is an easy style to accessorise. You can use anything that looks old or abused, like an old barrel or crate or filing cabinet. I can just imagine your teenage son drooling over this space!